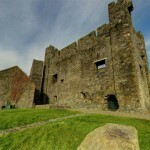 Affreca, daughter of the King of Man and wife of John de Courcy, Anglo-Norman invader of East Ulster, founded the abbey in 1193. 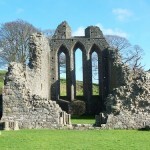 The Abbey was colonised by Cistercian monks from Cumbria. 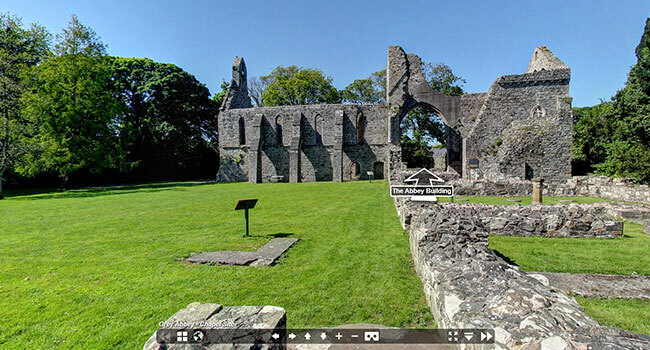 The French background of the Cistercian Order and the English origins of Grey Abbey resulted in an elegant Gothic building with tall pointed lancet windows, the first truly Gothic structure in Ireland. The monks had great knowledge of plants and made use of them in their practice of medicine. One of the great features of Grey Abbey today is a carefully recreated Herb Garden, containing over fifty varieties of medicinal plants and herbs that you are free to stroll through. 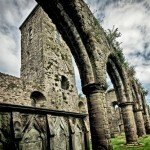 The Abbey is an important historical site in Northern Ireland is set in the beautiful landscaped parkland of 18th-century Rosemount House but visitors should note that these grounds are PRIVATE. 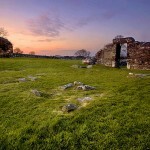 You are welcome to wander among the ruins and the lawns, where you can also picnic. 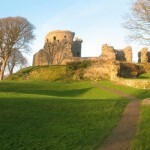 There are other sites linked with John de Courcy, the most important of which are: Cathedral Hill and Mound of Down, both at Downpatrick and the castles at Carrickfergus, Dundrum and Inch Abbey.